The opioid crisis has reached the workplace, but employers are not ready. The impact of the opioid crisis in the country is staggering. From 1999 to 2017, nearly 400,000 people in the U.S. died from opioid-related overdoses, and half of those deaths were of people using prescription opioids. Beyond those who died through overdose, this public health emergency affects many more people. One study says that in 2016, health care providers wrote more than 214 million prescriptions for opioid pain medication. In that same year, as many as 11 million people in the U.S. misused prescription opioids. When those people show up for work, employers have a problem. 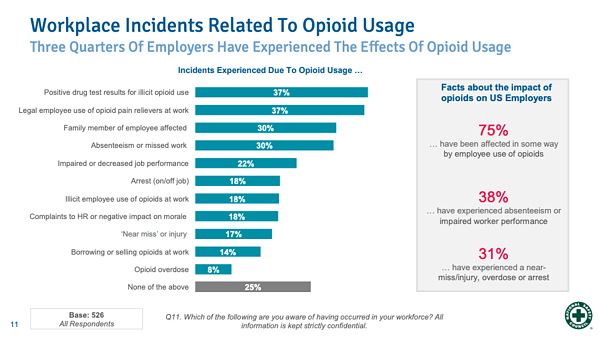 In a recent poll, 75% of employers say they have been directly affected by employee opioid use through absenteeism, impaired work performance, overdose, arrest, or injury. Despite this staggering statistic, only a fraction of those employers, 17%, feel extremely well prepared to address the issue. Opioids include prescription pain relievers like hydrocodone, oxycodone, morphine, codeine, and fentanyl. Opioids also include the illicit version of fentanyl and the illegal drug heroin. Opioids work by reducing the intensity of the brain’s pain signals, which is why they are given to cancer patients and individuals recovering from major surgery. When prescription opioids are taken as intended and for a limited time, they can be effective. However, the way opioids affect the brain’s chemistry makes it easy for patients to become dependent on them. Opioids activate areas of the brain that cause euphoria, making it more likely a person will crave them to seek that feeling again. Unfortunately, once a person begins to take opioids, they can quickly build up a tolerance to the current dosage, so they often need more of the drug to get the same effect. Opioid use, abuse, and overdose is increasing. In the U.S., the economic burden for prescription opioid misuse, which includes healthcare costs, lost productivity, addiction treatment, and criminal justice involvement, is estimated at $78.5 billion a year. To be clear, not everyone who uses prescription opioids is a danger to themselves or to the workplace. But how can an employer know for sure? In the poll, 86% of employers think taking prescription opioids can impair job performance. At the same time, only half of those surveyed believe they have the appropriate human resource policies to address opioids in the workplace. The majority of employers do not have a policy requiring employees to let their employer know when they are using a prescription opioid, and nearly 80% of employers do not feel confident spotting warning signs of opioid misuse. Despite the damage addiction cause companies and employees, employers do not seem to be focused on the health crisis. According to the poll, employers’ sights are set on hiring qualified workers, employee benefits, and compensation. Even as employers are focused on recruiting and benefits, they must recognize that the opioid crisis can affect those all areas of their as talented potential and current candidates may fail drug tests and opioid-related claims increase. As such, it is important to begin thinking of how to handle this epidemic in the workplace. Should an employee be required to disclose they are taking a prescription opioid? How does a manager gauge if an employee is impaired? Is disciplinary action taken if an employee’s opioid abuse affects performance? Is there an Employee Assistance Program (EAP) or other internal or external resources available to employees? Is there a process for an employee who recovered from opioid abuse to return to the job? How do these policies fit within the company’s overall culture? The answers may not be easy to come by, but it will be easier than facing a sudden opioid crisis in the workplace and being unprepared. The National Safety Council provides a free employer kit that can help get the conversation and strategizing started.